In 1827, James Bowie carved his way into American history at the Sandbar Fight, and soon every fighting man of the South and West had to have a knife like his. The bowie knife could cut like a razor, chop like a cleaver, and stab like a sword, and many considered it deadlier than a pistol at close range. So great was the dread it inspired that by 1838 it was banned in several states—a ban that did little to stanch the flow of blood. Bowie's story is well known, but what of the other cutters and stabbers of his day? Gunfighters have long been celebrated, but those who fought with the bowie knife have been largely ignored—until now. Unearthing accounts from memoirs, court records, regional histories, and newspaper archives, Paul Kirchner, author of the Paladin bestsellers The Deadliest Men and More of the Deadliest Men Who Ever Lived , presents their stories for the first time in Bowie Knife Fights, Fighters, and Fighting Techniques. Kirchner identifies and profiles the four greatest bowie knife fighters of history, as well as numerous other wielders of the blade. He details the weapon's use in the Texas War of Independence, the Mormon exodus, the Mexican War, the slave system, the Gold Rush, Bleeding Kansas, the Civil War, the Lincoln assassination, the Indian Wars, and the Western frontier. 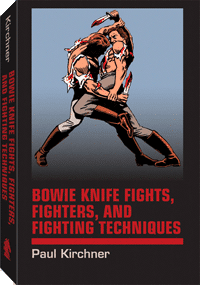 The book describes bowie knife fighting tricks and techniques and provides numerous accounts of knife-against-knife and knife-against-gun encounters. Its final chapter surveys the continued use of the bowie and other fighting knives in modern warfare. Paul Kirchner has been a writer and illustrator for more than 25 years. His work has appeared in publications ranging from Marvel Comics to The Wall Street Journal to Paladin author Jeff Cooper's books.